In 2011, CFA instituted a brand new title — the Grand of Distinction. To earn the title, a cat must receive a minimum of 30 finals over each of 3 separate show seasons. The show seasons do not have to be consecutive, and can be earned in either Championship (GCD) or Premiership (GPD). For more details, see our article Grand of Distinction: A New Title in CFA. 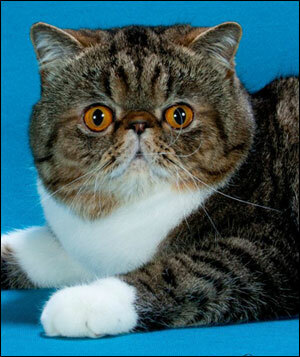 The very first cat of any breed to earn the award in CFA was an Exotic Shorthair — a Brown McTabby & White neuter named GC, GPD, NW Ivy Cat Quarterback. Read his story here . . . Listed below are the Exotic winners of the title to-date; separated by year, and listed in the order that they earned their title.